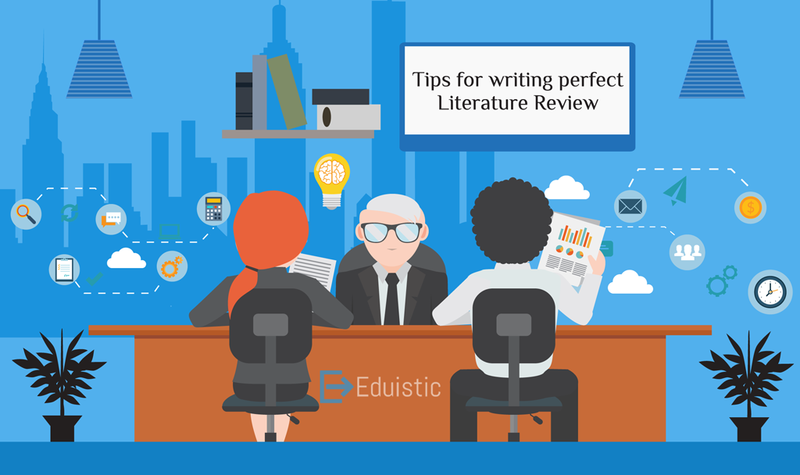 Tips to write a perfect literature review – Eduistic: Need Expert Help with your Studies? A literature review, as the name suggests, is a review or the specific viewpoints given by the various scholars, authors, researchers and article writers on the topic of concern. Literature reviews contain the authentic information or the knowledge of the particular topic on which, the research is to be done. A literature review should be considered different from a book review. The main objective of a literature review is to give an overview or the outlook of the subject that is to be analyzed. In order to write a literature review, one should keep the goal of the particular review in mind. It should contain the information that is relevant to the topic or the subject under consideration. It should highlight the different point of views given by distinct authors, scholars and researchers. It should also include the critical point of view of different authors that can shed light on both aspects, i.e. positive and negative of the area under discussion. It can also include the previous studies that support the topic. It can contain a conceptual framework which directly highlights the key points and sub key points of the literature review and helps the reader to understand it easily. It must consider mentioning the gaps in the previous researches. It should be rich in references, that is, if number of references is high, it shows the richness of the content of the literature review. It must show the general relation of the review with the literature. It must be ended with the summary that concludes the literature review. Assignment of topic or defining a topic: a research review can be written when a certain topic or the subject is assigned to it. Topic can also be subdivided into sub topics to make the review more intensive. Content of review: the material that is to be included in the review should be searched carefully by using authentic search tools such as books, journals and scholarly articles. This point plays a crucial part in making the literature review genuine or authentic. Aim of the review: the objectivity of the research should be clearly defined in the literature review in terms of the nature or the behavior of the author’s viewpoints. Credibility of the review: a research review should ensure the significance or the values defined in it are convincing or not. Assurance of authenticity: all the data or information given under the review should be derived from the ideas given by the accredited authors, scholars and researchers but should not be copied as same as written by them. This practice avoids the issue of plagiarism. A literature review should simply define the perspective and ideas of the other authors with the direction of critics into it. It should not be vague and bulky to understand.